In November all the lamps of my first Canal House suddenly started giving a very feeble light. Pretty though it was, it meant there was something wrong in the electrical circuit. In order to get to the root of the problem, I had to turn my house so I could reach the back where all the wiring comes together. Quite a big job and I didn't have time for that until last week. After a time consuming process of elimination, I found the defective light on the upper landing and was able to fix it. While I was able to reach the back with my soldering iron, I added a couple of new lamps to the system. In my electrics drawer I found the table lamp with the two hearts. I'm not sure where I got this from, but it was a cheap light which I bought online I think. 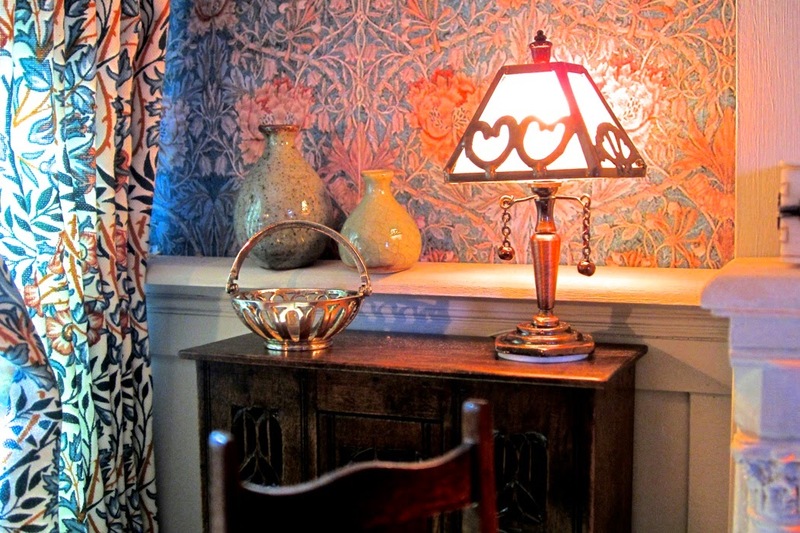 It fits perfectly in my Arts & Crafts room with the heart shapes reflected in the chair backs and the shape of the foot of the lamp reflected in the little Moroccan table. I still have to remove the white sticker pad underneath the lamp, I don't like those at all. In the kitchen I finally plugged in the small refrigerator I made ten years ago, it still works! So that is now ready for use. Looks good! 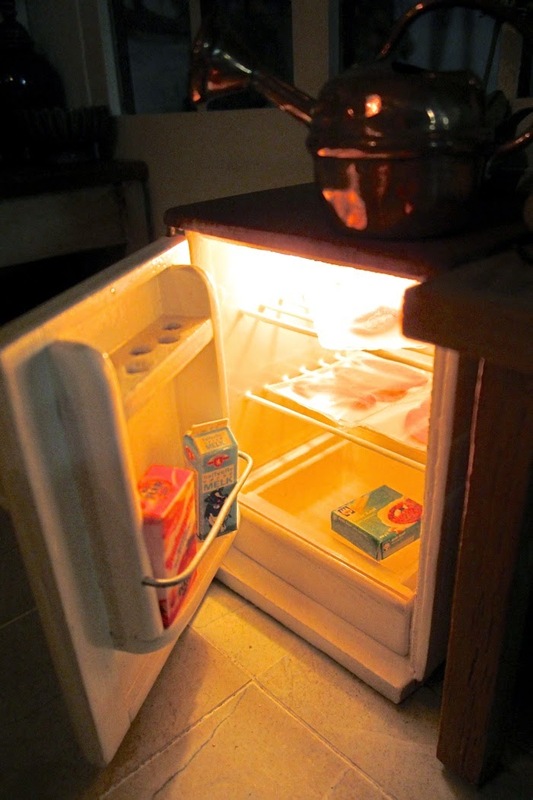 At last we can see what's in the fridge at night too. There is not much in the fridge. I think a food shopping trip is in order. Ah, there's the basket with groceries. Some white wine and...hang on, what's going on there?? It's that rat again! The one who stole my radishes in the garden. And now he's got a sausage! Cheeky little bugger. I think I need another cat! What a jewel is your doll house. Thank you Pepper. I must say I am really pleased with my small Canon camera. I've had it for years now but it still surprises me what it can do. Glad you where able to fix the "light problem". Although you don't want rats in your house these little ones do look cute. Good Morning Josje, How nice to wake this morning and find your posting. I always look forward to seeing what you have been doing. I do sympathize with elusive electrical problems but adding more lighting is always a positive. Interesting how the lamp that you bought some time ago reflects the shapes in the existing scene. I guess the adage that you should buy what appeals as you will always find the appropriate place for it is true. As always, Josje, wonderful warm atmosphere. PS. The wallpaper is still one of my favourites! Wonderful post, these pictures are stunning. I watch them with big pleasure, thank you for sharing Josje! Knap dat je dat elektra probleem zelf hebt weten op te lossen, ik denk dat ik er wel hulp bij zou moeten halen. Die rat, daar heb je gif voor hoor haha, wat is die mand mooi gewickerd trouwens, zo strak kan ik het niet. Mooie keuken heb je! El arreglo de la luz perfecto, esa luz..esas sombras, la mesa marroquí y la chimenea.. una luz calida que invita a relajarse. esa lámpara guardada hace años ha hecho un buen servicio y las ratas me encantan. The lights look great! Your photography skills flatter your house even more. Did the refrigerator come with a light or you installed it? Thank you! I made the refrigerator about ten years ago and added the light back then as well. I think the plans for the fridge came from a dolls house magazine. Me encanta el estilo que le has dado a la casa. Me gusta mucho como queda la nevera. Ah!!! y ese ratoncito es muy lindo, ¡ cuidado con el gato! Oh Josje, your Canal House is SO Fantastic!!! The lighted refrigerator is Awesome!!! (I now have to add learning to wire a refrigerator to my list of projects! LOL!) And the problem with the lighting, while annoying, has had Great results! The new lamp with the hearts is so appropriate and fitting for that room... and the refrigerator is just a Show stopper! As for the four legged thief,,,, as unpleasant as rodents are in RL.... in this case he is Adorable! And so well made!!! I am always so impressed with the level of craftsmanship in your projects..... your work is Very inspiring for me! Ah thank you Betsy! Well, wiring a miniature fridge couldn't be simpler...just drill a small hole in the back of it and put in a small bulb on a wire. The you have to plug it in of course, which in my case took about ten years, haha! I love the different light effects. It adds so much to the realism to the scene. How wonderful to find that lamp in your stash. It really looks perfect with everything in the room. I'm glad you figured out your lighting problem. What a great fridge! What an interesting project to create. That is a tutorial I would love to see. Those electrical problems are the least fun part of dolls houses. When I had located the problem light ficture, I nearly ripped the wall sconce off the wall (as it is stuck down with glue!). I was cutting round it with a knife to do as little damage to the wall as I could, when I felt a tiny bump in the wire a few inches away from the wall. I thought I might as well take a chance at cutting the wire off at that point and take a chance at that bump being a break in the wiring. Lo and behold, it was! So problem easily solved by attaching a new length of wiring, light fixture and wall saved! I Love the light emitting from the fridge because I can really relate to that! I am often making midnight raids to the kitchen and the light from the fridge is all that there is to see by. Anyway, that rat in the kitchen, is both cute and horrible. 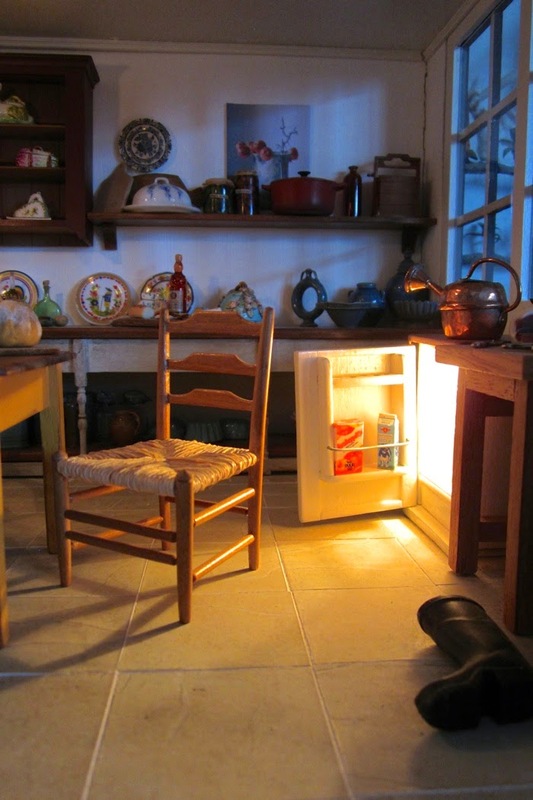 Lighting adds so much to a miniature scene, plus I adore you fridge with the light.....such an original idea! I too loved waking to your post....I look forward to the next!! Glad to hear it wasn't a bad start of the day ;-) Thank you Linda! There's always a sinking feeling when a light in the house doesn't perform, isn't there? You know that ahead of you is a time consuming process to discover the little blighter and then the exercise in bad language that follows as the thing has to be fixed! So glad to hear it wasn't too major an operation and your new lamp has added a little extra to the room. Lovely! What wonderful pictures. I'm glad you were able to fix the problem. The rooms have so much charm and character, and the fridge is just wonderful! I really am a HUGE admirer of your work. Thank you Giac! And thank you for inviting me to take part in the challenge, I felt very honored even though I'm not taking part! I sure love that refrigerator, and the way the light plays out of it into your kitchen scene. I am quite impressed with the precision of your work! Everything in the rooms is so perfect. Thank you Doug! I like the light too, it's fun to have a light at a different level in the room. Josie, the lights look wonderful now. I'm glad that you were able to fix them. The rat made my morning!LOL just be happy that he was kept busy with the sausage. We wouldn't want him chewing on the beautiful basket! Well that rat still hasn't left, I saw it again this morning! He's still chewing on that sausage, so thankfully the basket is still in one piece. I admire your taste for details. Everything is amazing and so beautiful. Your work always make me dream. That's very sweet of you Geneviève, thank you! Wat een pracht van een lamp en die mand geweldig! Meglio un innocente topino in miniatura! La tua casa è sempre più realistica ed è sempre una gioia guardarla. Ahhh to dream, so wonderful! Thank you too! Hi Josje, and Happy New Year! I love the new little lamp - I love the base, because it is not just the usual plain brass you see repeated everywhere, good choice! And a rat in your kitchen? yes, I think an army of cats is in order! Thank you Jonquil, Happy New Year to you too! It is not easy to stay away from the mass produced lamps, if you have to work to a budget. But I customize many cheaper lights so they become 'mine'. In this case that was not necessary I think. 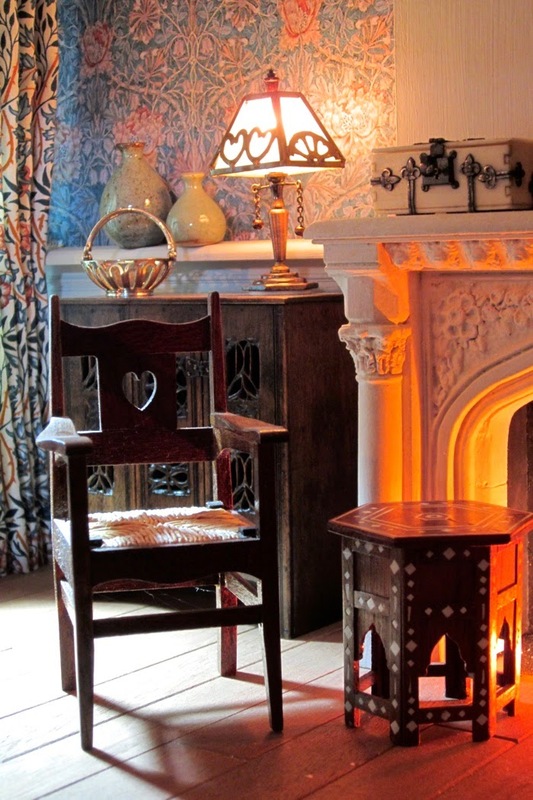 The contrast of cool light from the window and the warm firelight looks beautifully realistic. 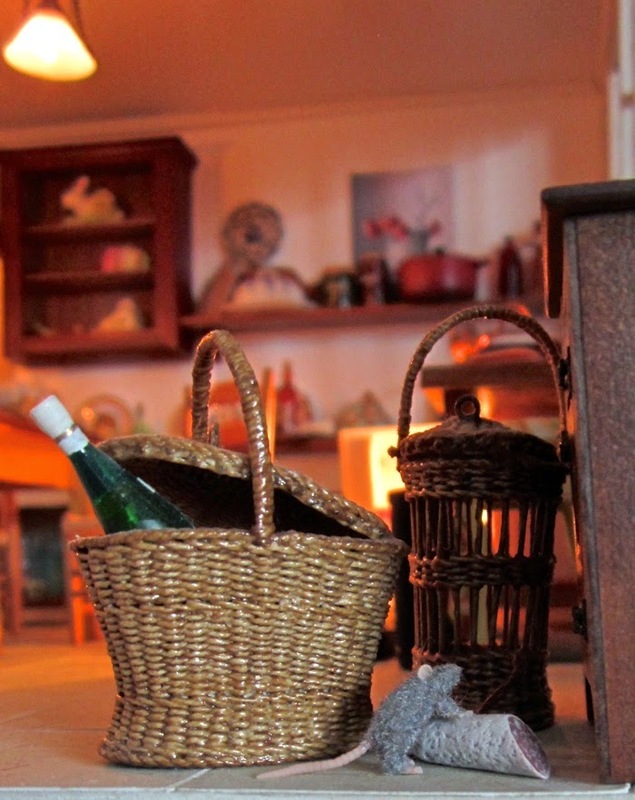 I agree the little lamp goes perfectly in that room, and love the little rat stealing the salami. 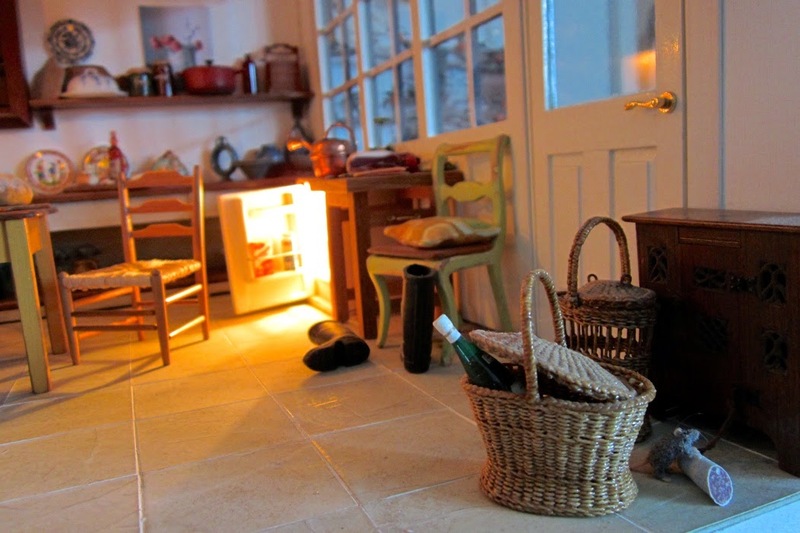 The kitchen looks very cosy and livable. Dank je Adrie. Ik hoop dat het goed met je gaat! Preciosa casa y muy bien colocadas las fuentes de luz. Your miniature work is absolutely gorgeous! 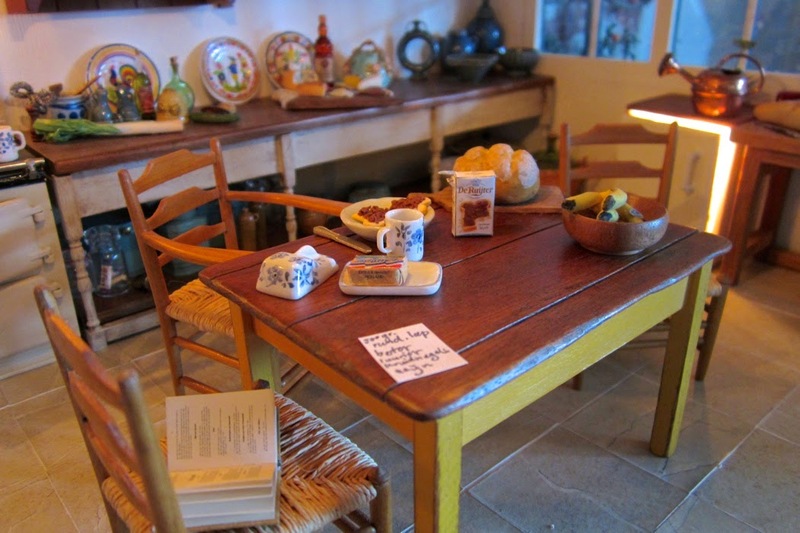 I'm new to the mini world, having just bought my first dollhouse, and I've spent hours perusing your blog -- so fascinating! Thank you for taking the time to share your craft! Thank you for your kind words Rhonda. Have fun with your dollhouse! Thank you Alessandra! Yes I'm fine, Ive just been busy with other things. Thank you though! Always great stories, and as ever, excellent pictures. Yes, play with light! Thank you Debora. Without light, we don't see anything. With it, we can play, manipulate what we see. Lovely.